The perfect PERSONALIZED "Letters to my Future Husband" Blank Journal Notebook! Customize the cover with your fiance or boyfriend's name. Simply leave a note at check out with the name you would like on your journal cover. Letters to my Future Husband is a perfect keepsake gift to write letters, thought and ideas for the future to your Future Husband. 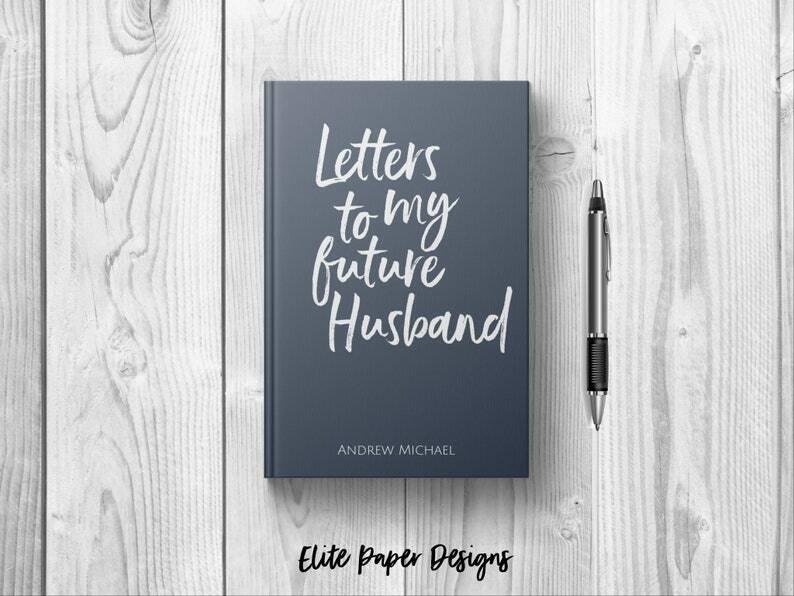 This blank lined notebook features the words "Letters to My Future Husband" on the cover and plenty of room to let your fiance know how much you appreciate him and how much he means to you. Letters to My Future Husband Writing Journal is lined to record all your thoughts, dreams and romantic ideas to your future husband or fiance. This Journal book comes with lined pages and can be used to write notes to your future husband on the months and days leading up to your wedding day. It is a thoughtful and very personal touch to add to your wedding day. Perfect gift to give as an engagement gift or a bridal shower gift for her. Capture all of the romantic, happy, or funny moments throughout your dating years while they are still clear in your mind. Express your love by writing letters to your future husband on a regular basis. * Choose from Lined, Dot Grid, or Blank pages in the interior. Letters to my Boyfriend Personalized Custom Name Journal. Future Husband Fiance. Birthday Engagement Meaningful One 1st Year BF Gift Idea. So cute and just like the picture!